100 Face Challenge: Noah (#5)! A friend sent me a photo of her dog, Noah, and I had to draw him right away. The eyes of a dog are impossible to resist. You just melt into them! And as you know, I’m a sucker for eyes! I’ve tried drawing this dog at least ten times with all different mediums: graphite, pen and colored pencil. This was done in either 2B or 4B graphite. The 3/4 view isn’t the easiest, but it’s the one I’m drawn to most, of all the photos she sent. This is the best attempt I’ve made so far with Noah, but I’m determined to keep trying until all of us (including Noah) are happy with it! I’ve never used a blending stump before, but on this toothy mixed media paper, it made a huge difference. Something to remember for the future. This is also the first time I’ve spent over three hours on one drawing. It was so much fun, though, even so. Of all the animals I’ve tried, I enjoy drawing dogs the most. You can read so much from their eyes. It’s such a joy to draw them. Happy Monday, and I hope your ears perk up when the paint and colored pencils start calling you later! Peace. Oh Laura, this one turned out so beautiful…it’s now my favorite! 😉 You captured him so well! Thank you for choosing him as one of your subjects. Now I just need to get a copy of this one! hehe no doubt! Love dog eyes. There’s nothing like them. Watercolor is sooo much harder though. I really don’t know how people get so realistic with it. It’s beautiful and I love it, but I think maybe abstract is the way to go (for me at least). I’m not happy unless something really looks like the photo. This one doesn’t even, really, but it’s the closest I’ve come so far. It’s interesting, when I paint I think not to look photographic. If you want a photo, take one. Paint should show something more. 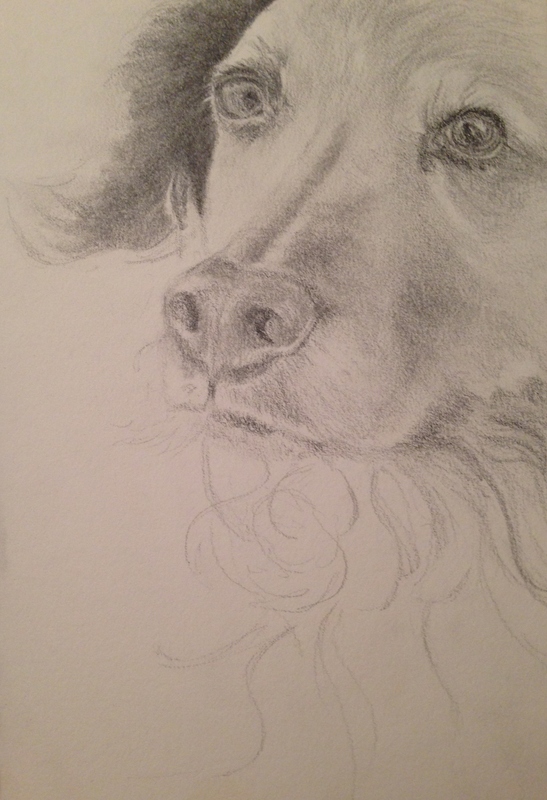 Lovely drawing – gorgeous dog! Thanks, Michael! He really is a beautiful dog. So much gorgeous hair. Really a pleasure to gaze at and study. Your dog portraits are wonderful today, Laura. You have captured Noah’s soulful and loving eyes. I’m happy to hear you let yourself get immersed in you drawing with no time limit. 😍 carry on and draw!! Drawing animals full time is a very doable goal, I’d say you are making a very good start. Email me smann45333@aol.com and the I’ll give you my phone, let’s talk. You’ve got “it” for animals for sure! Thanks, CAS! I really appreciate it. I’d love to be doing “it” full-time! Really, really good. I love how you defined things with shadow. Thanks, Kirk. This dog was such a pleasure to look at and study. I think that “new way of seeing” is the best thing about any type of art practice, in any medium. Laura what a great job done! I was just keep loooking and looking at the sketch of Noah. Highlights, Midtones, Shadows all are just perfect! The eyes make a drawing. Nice work! Thanks, Carmel! I am totally mesmerized by eyes. I think right from the beginning, I’ve been fascinated by getting them down on paper. Uhm….I think Noah would give you two paws up for this rendition!! This is masterful, Laura!! 💜😃😃It’s so incredibly striking…the eyes are indeed amazing! Well done! Charlie, you made my day with this comment; I really appreciate it, my friend! Oh how I’d love it if I could somehow find a way to do this gig full-time (without going bankrupt lol). Staring into the eyes of an animals is just….bliss. Thanks again. Thanks so much, Susan! 😀 I really enjoyed this one. Thanks so much, Jean! It was a pleasure! Laura, just love how you caught this dogs expression and love how the drawing is off center like he is peeking around a corner. Thanks so much, Julie! It was supposed to be an eye study only, but the eye turned out so well, I kept going. It’s an odd placement on the page, but I actually like it too! I’m glad you do as well! Thanks! Oh wow, what a sweet rendering! fabulous! Thanks, Rachel! I hope I find more faces like that. Was really a pleasure. Debi, you made my day with this one, lady! I really appreciate your visit and comment. I would love to do this full-time, honestly. Is this a pipe dream, or something to realistically shoot for? Tell me, great art guru! hehe. I’m so glad you enjoyed this! It was a joy to create. Maybe the key is spending longer, and posting less often? Beautiful drawing; it almost breathes! Thanks so much, Nexi! It was a real pleasure to draw this beautiful animal. So glad you enjoyed! This graphite illustration is gorgeous; I especially like the details with the eyes! Thanks! The eyes are the coolest part, for me. You can read a dog’s mind, practically. Glad you enjoyed it! Absolutely adorable, and yes, the eyes of a dog can melt your heart in seconds….. 🙂 Another fantastic drawing, Laura! Thanks so much, Donna! So glad you like this one! It was a joy to draw him. This really is a beautiful dog portrait Laura – those eyes are awesome. There is a wonderful soft quality to the whole portrait. Wonderful work!! Thank you, Mary! I’m hoping that 2016 may be the year to take this to the next level. Really enjoying drawing at this point more than painting. Just seems easier right now. And there’s nothing like the smell and feel of pencil against paper. I’m really glad you like this, as a fellow graphite lover! This series has been some of your best work and my favorites. Wonderful to see you so happy and feeling great about what you are doing – it shows! Beautiful drawing and those eyes, wow!, I reckon you could easily draw Charlie Laura!! Denis, I really wish! I have the hardest time with black fur. We lost both our cats in just over a year, and the one who passed in ’14 was all black. I have tried to draw him so many times and failed. Your Charlie’s features are all within the black fur, and so I hesitate to even try. At some point, I’ll get past this, but I don’t feel I’m there yet. I’d hate to disappoint you. I am definitely keeping Charlie in mind, though! I really appreciate your encouragement. Wow! Awesome shading! Such beautiful eyes and fur and the 3/4 pose very visually appealing. Enjoying your portrait series :-). Thanks for sharing your work. Thank you, Myriam, for your kind words. This animal was a joy to draw, he really was. I could have continued forever. I think it was close to 1am before I put the pencil down. (And it was only supposed to be an eye study!) It’s so nice when an image draws you in that way. I got lost in his gaze completely. Glad you got drawn into the drawing ;-). I like that experience. Plus it is nice to make some more detailed and refined drawings sometimes. I like that you try a variety of approaches and styles. The dog you drew with just a few lines is beautiful too. Thanks, Myriam! I am trying to decide – I really may blog less often and only post work like this. When I’m trying to get stuff up every day, well, how good is each piece going to be? I usually never spend more than an hour, and often much less, on the work I post here. Not enough hours in the day. This one just drew me in and I had tried this view of this dog so many times…….I was so happy with how the one eye looked, I tried the other and put it approximately in the right spot and was so happy I just kept going. I think it takes the right photo and the right look in the eye of the subject to draw me the way this dog does. I’m really glad you enjoyed it. You mentioned my two favorites of the year by including that dog with the very spare lines. That one only took 3-4 minutes but I tried soooo many afterward that I didn’t like nearly as much. You can’t overthink anything. A big problem I have lol. Anyway, I hardly ever have the time or energy to spend hours on one piece, but I am thinking that should maybe be my next challenge, or piece of this one. Because I have the feeling it might take my work to the next level. I’d like to become a pet portraitist, and really would like to include people as well. It may be a dream, but I feel the need to at least try, since this thing doesn’t seem to let me alone. A day isn’t satisfying without a drawing in it anymore! Thanks for your comment. Hmm… Well I find it interesting that you post quick sketches, experiments and more time-consuming pieces. I don’t have time to comment every day but I usually have time to browse and it is always a pleasure to see what you are working on. I greatly appreciate your enthusiasm for trying new things and putting time into drawing every day. And it is really neat to see your progress. And when you find a big chunk of time to draw and something amazing happens on your paper, I feel excitement! But I couldn’t post every day. I find it too stressful and time consuming. So, I totally support not posting every day (days off are awesome!!!). But maybe you like your blog to be a creative daily journal with which you like to connect every day… I’m sure you’ll do what feels right for you :-). Oh, and you can work on long pieces over multiple days. Little chunks of time here and there. Thanks, Myriam! Social media is kind of addictive and fun. I see reasons to post daily and reasons not to, but I’ve never sat down to make a pro and con list and see which side wins. So at this point, I just keep doing whatever feels good at the time. hehe. I’m really glad you’re enjoying what you see! I always enjoy your work too. Forgot to say… You are already a good portraitist. Your lines and shading are beautiful, your eyes always have soul and you often capture the essence of the animal or person. And your portraits keep getting better! Love your finch by the way! I’ll give it a sweet comment some time soon :-). lol, thank you! 😀 I really appreciate that! Thank you! This is one of my favorites. I’m really glad you like it. Laura I think you are doing wonderful. 3/4 view is very difficult, and you’ve sketched it very well. I’ve taught classes on drawing pets, using graphite and using waxed based colored pencils, burnishing (blending) in strokes. The eyes definitely brings a drawing to life. Keep up the good work. Thank you so much!!! You just made my night! 😀 I really appreciate your kind encouragement!